Today is Kurt Cobain’s birthday and marks the day Kurt would have turned 45. His band Nirvana changed the face of the music industry forever in the 90’s, and Kurt Cobain is Nick’s favorite musician of all time. When he died, he was only 27 years old. While he left us way too young, he certainly did his duty as he saw it – he challenged all established boundaries and rules of music in the rock world. I’ve been a Nirvana fan since their single “Smells Like Teen Spirit” came out in 1991 from their second album, “Nevermind“, but I never got to go to a concert. When the 20th Anniversary of Nevermind was celebrated last year, a previously unreleased concert, “Live At The Paramount” was made available and Nick snagged a limited edition copy. We were stoked to watch it tonight. 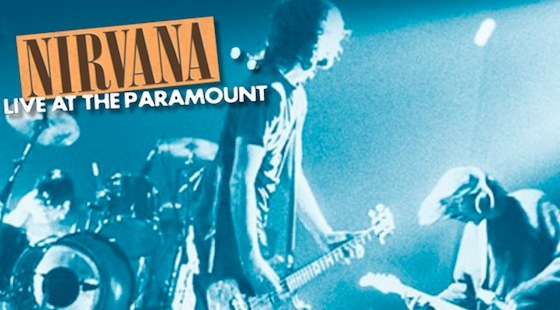 “Live At the Paramount” is the only Nirvana concert that was shot on 16mm film, and it really was a fantastic recording. Nirvana’s music is very emotional – sometimes angry, sometimes contemplative, always raw – and that came through in their live performance, which I was so happy to see. There are unfortunately plenty of musical acts that have good sounding albums but are not too great when it comes to live concerts. Nirvana was not one of them. The energy and dedication to the music that the band shows is enthralling. When all of your songs are as emotionally charged as Nirvana’s, it’s not an easy task to give so much of yourself at every performance – but that’s another reason Nirvana was such a great band – because they did write their own songs, and that makes every one that much more powerful, and important to the group. I’m really glad I got to see this concert. While it’s sad to be reminded of the tragedy of loss in the story of Kurt Cobain, it’s also comforting to be able to appreciate his talent, his spirit, and his humanness by seeing him perform, and nice to know that that performance is captured for others to enjoy even though he is gone.